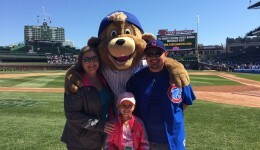 Home / Articles tagged with "Dr. Jason Canner"
Articles for Tag: "Dr. Jason Canner"
Mya Tinajero took a break from daily chemotherapy treatments to serve as an Honorary Bat Kid at Wrigley Field. Even though she’s only 10, Emily Beazley has overcome some major challenges in her fight against cancer. Read her inspiring story.